Lily Casey, oldest of three children, was a tough young girl. Born in 1903 in West Texas, Lily had to be tough to help her family live daily life. By eleven, she was in charge of hiring help for her father, who raised carriage horses. At fifteen, she rode 500 miles alone on horseback to take a teaching job in Arizona. She learns to ride like a cowboy, to play poker like a card shark, and she isn’t afraid to draw her pistol when necessary. The American West has been romanticized by our movies, TV shows, and books. In “Half Broke Horses,” we see what life was really like, and honestly, I think that Lily Casey puts all those TV and movie cowboys—men or women—to shame. She is a strong woman, and she leaves an impression wherever she goes. 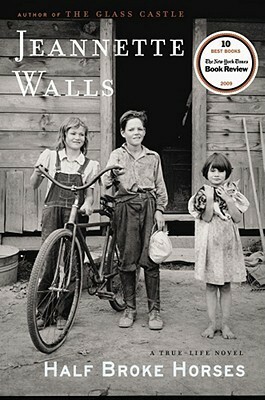 Lily is the grandmother of the author, Jeannette Walls, of “The Glass Castle” fame. Jeannette wrote this book based upon family stories of Lily’s life, and in doing so, she gives us a wonderful glimpse of the true “Old West.” Her prose captures Lily’s voice, which Jeannette says she still clearly remembers. Lily Casey accepted life as it came to her, and dealt her hand as best she could. I will remember her no-nonsense, direct attitude toward life for a long time to come.